Matt is going through an intense board game phase. He is building an epic collection of Spiel des Jahres winners and player favorites that are now currently taking up residence on our shelf of wonders-our six shelf bookcase that holds all of my toys (Johnny Depp action figures) and his anime DVDs. We stuck a flag in our favorite coffeehouse and have been spending many an afternoon and evening across from one another, strategizing. It’s been a bit of a challenge acquiring the best combination of games that we can play together, however. Being an Action Adventure kind of gamer, I am all for simple moves and rules. Long term strategies are not really my forte. My boyfriend, on the other hand, is wicked brilliant and quite comfortable with board games that come in boxes that weigh as much as our fat cat Mina and include a treasure trove of tiny men, cards, miniature houses, meeple sheep, colorful glass marbles and small bound novels containing the rules. You may be thinking, ‘Like Risk?’ And I would say to you, pshaw, my friend, that’s some Parker Brothers baby talk. So after a lengthy (and ongoing) quest, we have found several games that both of us enjoy together. And since this is a video game blog I thought I would highlight a couple of them that are also available via XBLA. I really like to play Carcassonne because it’s like an interactive puzzle game. There are many different strategies to win but none that involve serious analysis from move one. As you place the tiles a beautiful pastoral scene with roads and castles emerges, a landscape shaped according to you and your opponent’s decisions (see above picture). I admit, sometimes I place pieces just because I am trying to fill a gap between the tiles. Carcassonne is the kind of game that is best played on a lazy Sunday afternoon or bundled up and taken on vacation. We took it along on our Alaskan cruise last summer and spent a few lovely afternoons in the front facing bar looking over the waters of the Inside Passage while building the French cityscape. One of the great things about playing via the XBLA version is the computer scores the game for you (and adds horse and church bell sound effects while doing so! ), which is a blessing as it can get confusing. There are also many expansions for the game that add different rules and flavors to the gameplay. If given a choice, I would rather play Ticket to Ride over any other game we own. I first played this one via Arcade and liked it, but there is something about the physical board and the tiny trains that is hard to resist. Ticket to Ride is a stealth game. 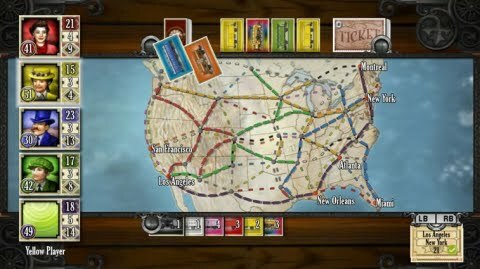 Basically, you are trying to connect two points on a map using matching colored cards to build routes-like the blue route that connects Houston to New York in the screenshot above. But your opponent may be trying to claim a similar route according to what Destination Card they have chosen. So you have to fool them into thinking you may be going somewhere else or they may block your path with their own trains (jerks! )-a fun game of misdirection. I think I like this one because I win a lot. Hey, it’s one of the only ones, so I can glow about it just a little. More than that, however, I just like the Battleship aspect of trying to guess what your opponent is doing based on the clues that emerge during gameplay while still trying to accomplish your own goal. And being in the travel industry (sigh), I also like the maps. Matt thinks I like certain games because of their settings and he is somewhat right when it comes to Ticket to Ride. I also like that it’s another simplistic board game where your only real strategy is to keep a secret as long as you can (and build a train!). We have four different versions: USA, USA 1910, France and Europe. The classic USA version is my favorite, but the European versions add some different kinds of routing and rules to the game. Ticket to Ride sounds interesting. We should play one of these next week! Abi-I think Matt is bringing Carcassonne. It's always a surprise what comes out of the bag when we get to the Wayward. The Xbox is Dead. Long Live the Xbox!